Approximately 20 million Americans are afflicted with a common sleep disorder called sleep apnea. Unfortunately, many of us are unaware that a sleep disorder could be the underlying cause of our health problems, while others fortunately are aware of their sleep disorder but completely uninformed of the severe consequences of untreated sleep apnea. While the symptoms of sleep apnea may differ between men and women, the condition is associated equally. Sleep apnea is a common sleep disorder that occurs when a person’s breathing is interrupted during sleep. People with untreated sleep apnea stop breathing repeatedly during their sleep. These breathing pauses can last from a few seconds to minutes. They may occur 30 times or more an hour. When normal breathing starts up again, it’s usually with a loud snort or choking sound. Obstructive Sleep Apnea (OSA): The more common of the two forms of apnea, in which breathing is interrupted by a physical blockage in the upper airways, usually because of the soft tissues of the throat and tongue collapsing into the airway. 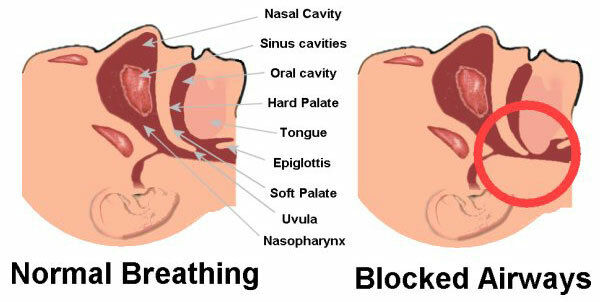 Central Sleep Apnea (CSA): Unlike OSA, the airway is not blocked, but the brain fails to signal the respiratory system to breathe. One of the most common signs of sleep apnea is loud and ongoing snoring. Snoring is the sound produced by vibrations in the upper respiratory airways during sleep and is caused by partial blockage or obstructions as air is being constrained from moving easily through the airways. It may be a common symptom of sleep apnea but snoring doesn’t necessarily mean you have the disorder. However, if your snoring is loud, disruptive, and occurs on a nightly basis, it could very well be a sign of sleep apnea. If you find yourself always fighting sleepiness during the daytime, this may be a symptom of sleep apnea. This symptom is often overlooked and is known as excessive daytime sleepiness (EDS), which is a chronic feeling of overwhelming daytime fatigue. Studies show obstructive sleep apnea is diagnosed more commonly in men than in women. There has been evidence that women with sleep apnea are more profoundly affected in the areas of the brain that regulate mood and decision-making. Sleep apnea in both men and women often experience varying symptoms. Men often report symptoms such as snoring, waking up gasping for air or snorting, as women report symptoms like fatigue, anxiety and depression. Though sleep apnea may be primarily be considered more common in men, both genders are associated with equally serious health consequences especially if left untreated. If you experience any of the above signs and symptoms or you need additional information, please contact our offices at 828-438-1930. At Ear, Sinus and Allergy Center, PA, Dr. Bruce Jones will always ensure you receive the right treatment that works best for you.